In the run-up to the presidential election, mainstream media not only downplays independent parties, it suppresses them. Fishtank‘s Lindsay France mocked the Greens in her September 30th RT show: “They’re not running a serious campaign!” Recent tweet includes a claim she has limited material to work with. No wonder news anchors can easily steer clear of the most important issue. What is the most important national issue in 2016? 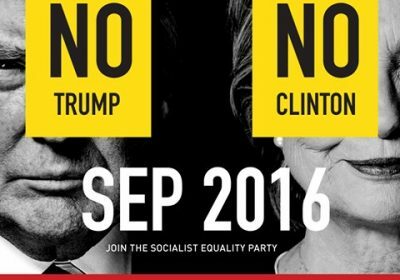 Socialist Equality Party (SEP) believes that the biggest issue–the elephant in the room–is the drive to World War III. Today the war on terror is working into a global confrontation with both candidates in the 2016 presidential election advocating nuclear escalation against nuclear-armed Russia and China. The last 15 year of war, the last quarter century of war, has now become the possibility of war with Russia and China. Direct confrontations between nuclear armed powers which could wipe out humanity. This is a very real danger, and this is one of the reasons why it is not being talked about. This is not just your standard anti-war rhetoric of ANSWER Coalition or World Beyond War. Socialism, as characterized by the International Committee of the 4th International, wants to end class warfare and anti-imperialism as its root. By ending U.S. militarism, the Socialists will connect the tens of trillions of dollars in outstanding sums of money squandered in wars and bank-bailouts to the needs of the growing legions of poor. Thus SEP 2016 proposes an end to poverty and social inequality. My campaign is against capitalism and for socialism, where the working class will govern and have control of the industries and banks. That way, society will have the money for education, affordable housing, and basic things like health care and clean drinking water. White has spoken out against lead-poisoning in Flint, Michigan and wretched conditions including utility shut-offs in Detroit. Especially SEP has been involved in documenting the effects of the bankruptcy in Detroit, and published the book The Truth Behind the Bankruptcy of Detroit, a stark warning to other regions. The growth of anti-capitalist sentiment in the US, as revealed in the support of millions of workers and young people for the campaign of Bernie Sanders, has frightened the US ruling elite. It is stepping up its preparations for mass repression of social opposition in the United States while relying on the Democratic Party and its pseudo-left apologists to split workers along the lines of race, gender and sexual orientation. At the Detroit meeting, African-American writer and comrade Lawrence Porter stated that Black Lives Matter supports black capitalism. Non-profit activists meet at the bargaining table with Hillary Clinton seeking benefits for themselves. They have counterparts in the Asian-American Pacific Islander (AAPI) community whereby voters are convinced to favor Clinton. Both duopoly campaigns are portraying the police violence and riots as a simple black-white race paradigm to appeal to voters, when in reality government spying and police violence is heedless of race, color, or creed—only class. SEP distinguishes itself from the Green Party which does not go far enough. The Greens do not want to nationalize the banks and industries; nor do they want to end for-profit healthcare. The Green Party in Germany has supported the imperialistic wars and actions of NATO. Campaign SEP2016 seeks to unite workers and youth who are looking for an alternative to business-as-usual policies supported by the Democratic and Republican parties. 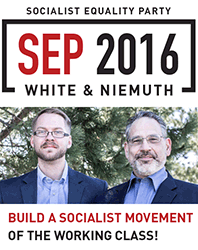 It hopes to build the SEP as an independent political party and voice of the working class.